I’ll offer this disclaimer up front: I am a very big fan of the Lord of the Rings Living Card. The reason I’m a big fan is because it is a fun game with excellent artwork, amazing theme, challenging gameplay, and an engaging narrative. Since I really enjoy the base game, I am predisposed to have a positive view of this expansion, so keep that in mind. Having said that, this isn’t one of the best expansions available, but if you’re interested in the game, you should still pick this one up. The quality of the components is great, as usual. The cards are well-made, and the artwork is up to the usual high standards. The gameplay is not changed significantly with this expansion, as it follows the same mechanics as the core set. One thing that stands out when playing through this adventure is the sheer number of locations that keep coming up. This may be frustratingly tedious for some players, and it will probably make this one of the adventures that isn’t replayed as much. Knowing how the rest of this adventure pack cycle plays out, I have to say that I like how the number of locations really adds to the narrative of the game. This expansion is setting the stage for ones to come, and it does a good job of presenting a long and exhausting search for signs of an elusive prey. By the time you’ve continued this hunt to it’s conclusion with the Return to Mirkwood, you will feel like you have participated in an engaging narrative arc. The story may start off a little slow, but it will be rewarding to stick with it until the end. Even if you don’t care for this quest, it is a worthwhile pack to get for the useful cards it adds that you can use to build your deck for later expansions. 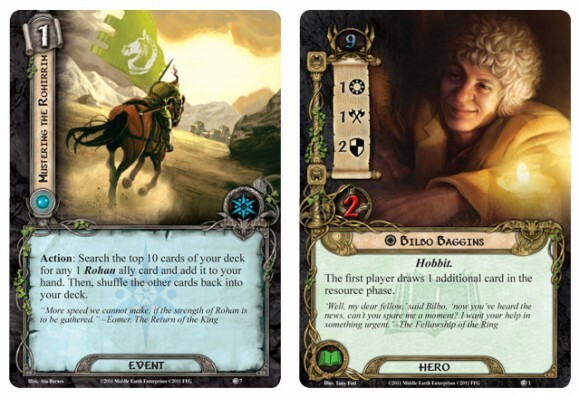 Dunedain Mark provides additional attack for your heroes, Song of Kings provides a leadership icon, and Bilbo Baggins provides a realitively low-cost lore hero that can be useful with his additional card drawing ability. There are also a few useful Eagle cards for anyone interested in focusing on an eagle deck. Overall, I think this is a nice expansion to a great game. It doesn’t shake things up, but it’s not meant to. It does offer more gameplay and sets the stage for an ongoing story, all at a reasonable price. It also provides some nice opportunities to expand your deck and play options. I would definitely recommend this to anyone who enjoys the base game and is looking for more adventures. The Hunt for Gollum was not the most exciting quest when I first played through it. I played it almost right after it first came out. The other reviews here sort of summed up my feelings on it. Revisiting the quest recently changed up those results a little bit. I played it with two other groups than from my original play through. The difficulty was not too far up there. Which, for a first quest in a first quest cycle was wise. The quest is filled with Locations, but it might be the fact that I have gotten more into the lore now that makes me enjoy that aspect of it more. The fact that during two stages of the quest, there is even more player choice is quite enjoyable. The first player has to look at some cards from the top of the encounter deck and put one into play. This added choice adds another level of strategy and tension to the game. There is nothing like looking at the 3 cards, picking the Clue card and being excited, only to have that card guarded by the Hunters from Mordor. After playing all the quests in this cycle, I see how this one fits into the story thematically. That is a big plus to story gamers. Not every quest, when played all in a row should just be the same climatic feeling. The whole cycle really nails the feeling of a good yarn. I was really looking forward to this. But I didn’t know what to expect at all. So I was a bit confused when I started my first game. My initial thought was: this is it? The pack comes with a lot of locations, so be sure to pack enough characters to beat the quests and place extra progress markers on other locations. When the first phase is over, the next one is a bit shorter. And you may choose between more cards from the draw pile and discard the rest. When the second part is over, you’ll need clue cards. If you don’t have any at the end of a round, you go back to the second phase. There’s not much to this pack, other than a lot of travel. It’s thematically correct, but it feels a bit dull. However, the game is challenging, especially when having step back to the second phase. I suggest you get this pack afterall, since you get some neutral song cards, and some useful eagle cards. And a nice adventure. Lord of the Rings: The Card Game has quickly become one of my favorites. It’s a challenging co-op with a stronger sense of narrative and character than other co-ops that I’ve played, and I enjoy that. The difficulty level tends to vary with the adventure, and to that end, this Gollum adventure seems to be fairly middle-of-the-road. I don’t mind that it is easier (we’re 50:50 with wins-loses). What it may lack in difficulty it makes up for in story–after playing this I want to buy the next adventure packs to see how this evolves and resolves. Add a Review for "The Hunt for Gollum Adventure Pack"